My family loves applesauce, and I make it often in the fall and winter. 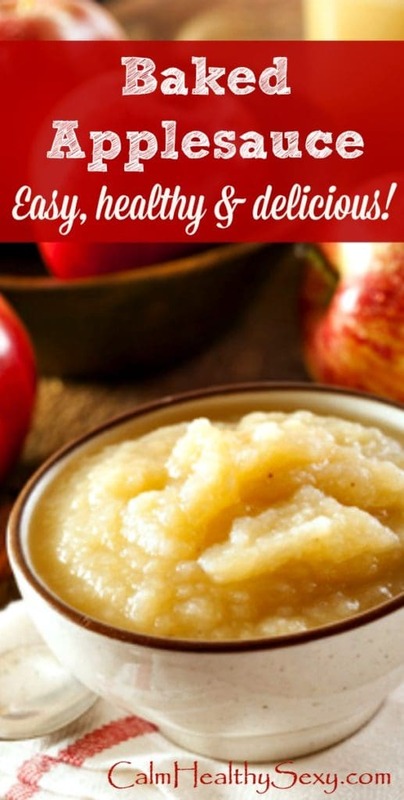 Homemade applesauce tastes wonderful – it’s much yummier than applesauce from a jar. And when you use a simple applesauce recipe and make your own, you control the ingredients, particularly the amount of sugar. Because I’m always looking for ways to feed my family healthy foods (applies are loaded with nutrients) and save time in the kitchen, I recently simplified my applesauce recipe. Actually, it’s more a process than a recipe, but I’ll share it in recipe format just to keep things simple. And I’ll admit right up front that, although I don’t usually share recipes that require a specific piece of equipment, this one does. 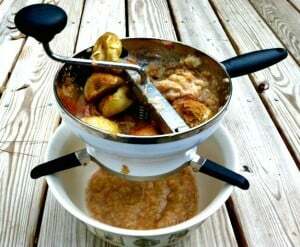 It uses a food mill, which allows you to skip the step of peeling, coring and slicing the apples – a huge timesaver. My food mill is an Oxo (affiliate link), and I love it. I tried a cheaper food mill first, but it aggravated me every time I used it. The Oxo is more expensive, but it repays me in time saved and frustration avoided. This method of making applesauce relies on baking the apples, rather than boiling them. 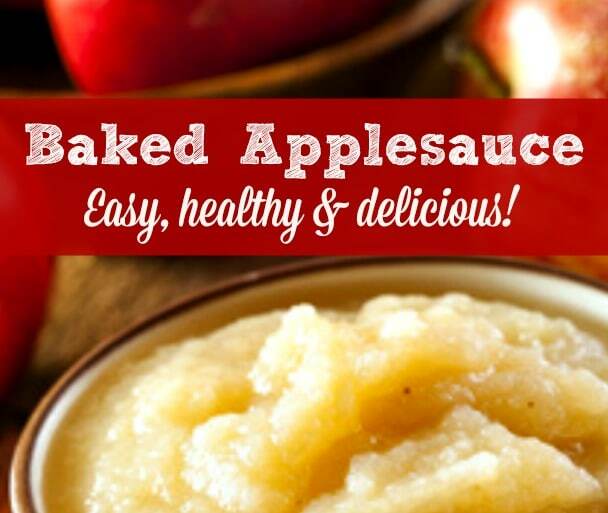 Baking saves hands-on time, and it gives the applesauce a rich, sweet taste. 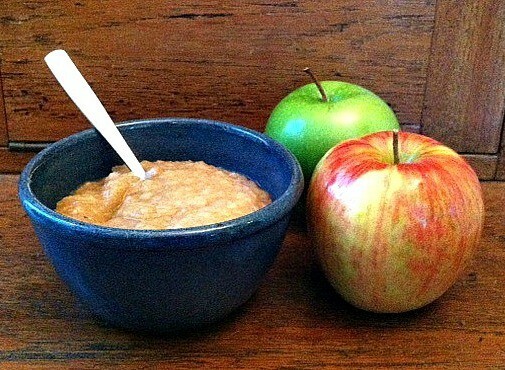 Run the apples through the mill and enjoy this delicious, nutritious applesauce warm or cold. Line a large baking sheet with foil (to make clean-up easier), lightly oil or spray the foil, and sprinkle with a small amount of cinnamon (optional, but makes the kitchen smell wonderful). Use approximately 6 large, 8 medium or 10 small apples. (The amounts in this recipe are very flexible. Also, consider doubling the recipe - you'll end up with twice as much applesauce for only a little bit of extra work.) You can use all one type of apple or a combination of 2 or 3 types - whatever you have on hand. Wash apples, cut in half, and place cut side down on baking sheet. Bake at 350 for 30-45 minutes, depending on the size and type of apples. The apples will be very soft when fully cooked. 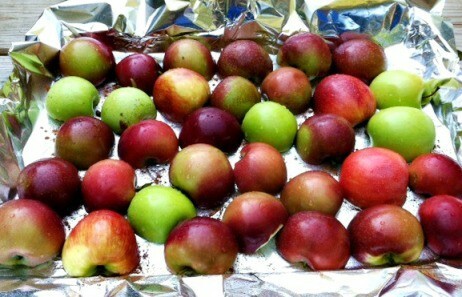 Remove apples from oven and cool slightly. Place them (carefully, they will be hot) into a food mill set over a large bowl or pot. Add any liquid from the baking pan. Add 1/4 cup apple juice or cider, 1 T. sugar or other sweetener, and 1/2-1 teaspoon cinnamon. Process the apples through the mill, adding additional juice/cider, sugar/sweetener and/or cinnamon as needed. If the applesauce is too sweet you can add a bit of lemon juice. If it's too tart add a bit more sugar/sweetener. Serve warm or cold. Store in refrigerator. This looks quite simple. Does a food mill keep the seeds cores and skin out of the sauce? I always peel my apples. Even organic apples are sprayed here in our valley. Sometimes the spray is made from tobacco. Just wanted my organic apple eating friends know that they might not even want to eat those skins. 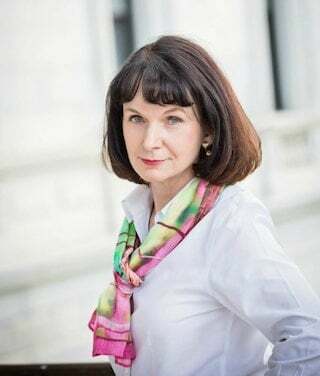 Hi Lori – Borrowing a food mill to try it out is a great idea! You definitely don’t want another piece of equipment hanging around your kitchen if it isn’t something you’ll really enjoy using. Homemade is always better! This looks phenomenal! I bet the flavor is outstanding! Thanks Tanya. Yes, the flavor of this is very, very good! What a great way to make applesauce! Thank you for sharing it with us at the Hearth and Soul hop. I’d never thought of using an apple mill, might have to try it out sometime. Thanks for sharing on the weekend re-Treat link party. Thanks Britni. I love my food mill! What a great idea, baked applesause. I gatta’ try it. Thanks Rick. I hope you like it. Hi Gaye! Stopping in from Let’s Get Real. Thanks so much for being part of our growing community. My kids love, love, love homemade applesauce and you are right that peeling takes forever. Not to mention I usually catch a knuckle. I really need to invest in a food mill. I’ve never baded apples for applesauce. I need to give that a try this week. Thanks Christina. I especially wanted to get this post up so I could share it at Let’s Get Real! Thanks so much. I hope you like it if you decide to give it a try.